Click here or use the search bar to view our Kazak rugs. Kazak (or Qazax) is a small city in the Northwest of Azerbaijan controlling routes into Armenia and Georgia. 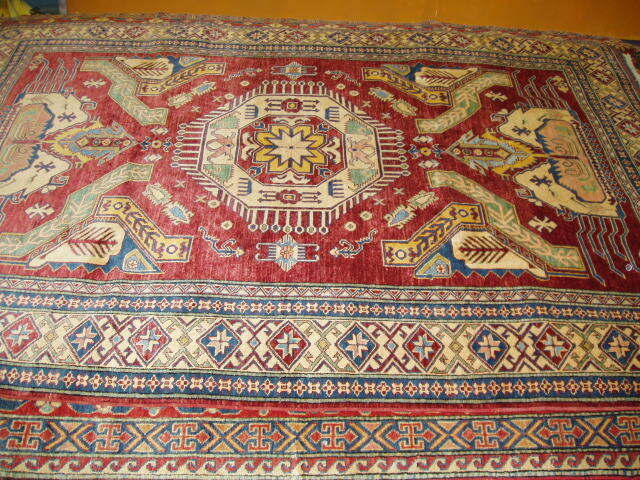 Kazak rugs however are mainly woven by the people of Armenia and Afghanistan who are influenced by the Caucasian designs found in old rugs from Russia and the USSR region as well as those found in rugs from the northern parts of the Persian empire. Typically geometric in pattern Kazaks tend to be red, yellow or gold and blue in colour. Designs can include animals, flowers and mediallions similar to tribal rugs but are almost always implemented with straight lines. Sherwan rugs are similar to Kazaks in design and colour as well as origin but can have all-over patterns. To view our Sherwans rugs click here.